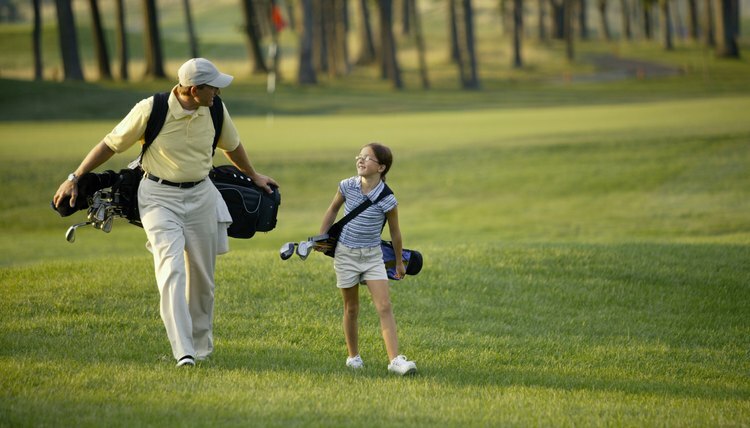 Youngsters need encouragement when they are learning the game of golf. Golf is a difficult game to learn. Many beginners feel frustrated with how long it takes to become a reasonably good player and shoot good scores. This frustration is reflected in the number of players who quit the game each year. According to National Golf Foundation data, between 2000 and 2010 the number of golfers in the United States actually declined from 28.8 million to 26.1 million. More people gave up golf than took the game up during that 10-year period. Many children as young as 6 have the muscle development, coordination and, most importantly, the concentration to begin to learn golf. But a good score for a young person depends to some extent how tall and strong he is. On a 450-yard par-4 hole, for example, a youngster who can only hit the ball 75 yards will take at least 6 strokes just to reach the green. Add two putts and he has scored an 8. Averaging 8 strokes per hole, his score would be 144 on a regulation par-72 course. This score would be good in the sense it was the best he could achieve given the limitation of how far he could hit each shot. In his book "Good Golf Made Easy," Tony Dear makes the bold statement that an individual in good physical condition, with at least some natural golf ability and a willingness to apply himself, should be able to shoot a score below 100 within a few weeks. But according to NGF surveys, 45 percent of all golfers average more than 100 strokes per round. So shooting a score of 108, or 2 over par per hole, could still be considered a good score for a beginner, given that he would be scoring better than 21 percent of all golfers, according to the NGF. The true measure of what a good score is for a beginning player should be whether his average score per round is steadily going down. Comparing his score to the par for the course, usually 72 strokes, can discourage him. For many beginners, a more reasonable goal is to try to shoot "even 5s" on the course -- in other words, shoot around 90 for the round, or 1 over par on each hole. If he currently is shooting 108 or so, 6 strokes per hole on average, reaching his goal would require lowering his score just one stroke per hole. The path to becoming a proficient golfer can be shortened for a beginner if he devotes enough time to taking lessons and plays frequently enough to gain confidence in his swing. A beginner whose busy schedule only allows for a trip to the links once a month must set modest goals. If his average score is 120 at the beginning of the golf season, averaging 5 strokes lower by the end of the season could be considered achieving a good score. A beginning golfer must also be realistic about his physical capabilities. Playing good golf requires a certain amount of muscle tone, strength and stamina. A beginner in overall excellent physical shape could set a goal of scoring below 90 strokes within his first year of play. Someone out of shape would need to do fitness training along with golf training. When he first takes up golf, his theoretical good score would be higher than that of his more athletic counterpart.